Courtesy of International Swimming Hall of Fame. The International Swimming Hall of Fame Induction Ceremony will be held on May 17th - 19th where the newest Hall of Fame honorees including swimmers Jason Lezak (USA), Otylia Jedrzejczak (Poland), Stephanie Rice (Australia), Britta Steffen (Germany); diver Ting Li (China); water polo player Alessandro Campagna (Italy); coach Boris Popov (Russia); synchronized swimmer Olga Sedakova (Russia); open water swimmer Dr. Marcy MacDonald (USA); contributor Dr. Ferenc Salamon (Hungary); and pioneer Alfred Nakache (France). 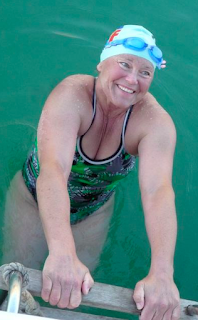 Dr. Marcella 'Marcy' MacDonald is a 55-year-old American marathon swimmer and podiatrist from Andover, Connecticut - and is known as The American Queen of the English Channel. After a long successful career as a channel and marathon swimmer, she will become one of the few dual inductees as an Honor Swimmer in both the International Swimming Hall of Fame and International Marathon Swimming Hall of Fame.